President Buhari received Their Royal Highnesses The Prince of Wales and The Duchess of Cornwall, at the State House, Abuja. The Prince of Wales, Charles and his wife, the Duchess of Cornwall, Camilla, arrived Nigeria on Tuesday in Abuja, as part of their nine-day tour to Africa. The Royal Couple started their tour in Gambia, stopped over in Ghana, before heading to Nigeria to meet President Muhammdu Buhari and have been welcomed in the State House. 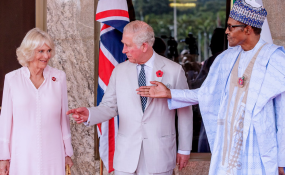 "The Prince of Wales will be looking at the causes, talking to people who are working in this area and together, seeing if we can find solutions and move on," The British High Commissioner to Nigeria, Paul Arkwright said on Sunday. He also stated that that the Prince Charles would engage in peace-building activities including addressing the issue of Fulani/ Farmers clashes. Prince Charles has not been to Nigeria since 2006 meanwhile his wife, the Duchess of Cornwall, has never been to Nigeria. The visit makes it her first time in Nigeria. The Royal Couple's visit comes months after British Prime Minister Theresa May visited Nigeria for trade and security talks.